Cooking is empowering. And it’s unique, in that this simple exercise provides you with one of the few daily necessities for survival—food. You can’t say that for going to the gym, or writing a brilliant essay, as empowering as those activities may be. It’s not always the case that whipping up a plate of dinner gives you a great sense of personal accomplishment. But when you cook something that surprises, impresses even yourself (and as a bonus, your friends or family), there’s a sweet taste of victory that lingers long after the last delicious morsel. Knowing that you can make something that had once seemed impossible to create in your own kitchen is a great piece of knowledge, indeed. It can make you feel all-powerful, ever-capable, and sort of mischievous—a one-woman (or -man) act of defiance against long-held assumptions. 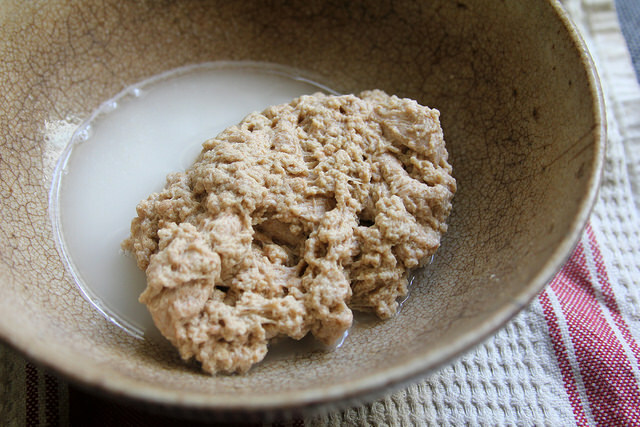 I discovered how to make seitan through an acquaintance, Chris Kim at Monk’s Meats, who had briefly, verbally described the process of kneading wheat-flour dough and rinsing it under water until the starchy water ran clear. The resulting mass, he promised, was gluten. Incredulous, I rushed home to try it out simply out of a sense of aggravating curiosity. And lo and behold—it worked. The resulting ball of gummy gluten was easy to work with; it can be cut into neat pieces to stew or braise or deep-fry or do whatever you wanted with. I wanted to stir-fry it. I pressed this strange, air pocket-riddled substance into a flattish shape that resembled that of a flank steak, and sliced it thinly, as you would beef for a stir-fry. 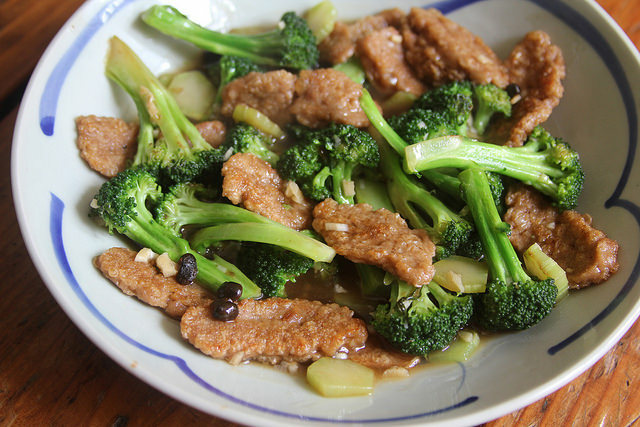 And I followed suit by stir-frying it with broccoli and garlic sauce, which is a familiar home-cooked dish for me. My boyfriend and I gobbled it up over bowls of rice, noting the absence of that beefy, mineral taste of real meat while appreciating it for its own chewy, crispy virtues. It was new, and exciting. 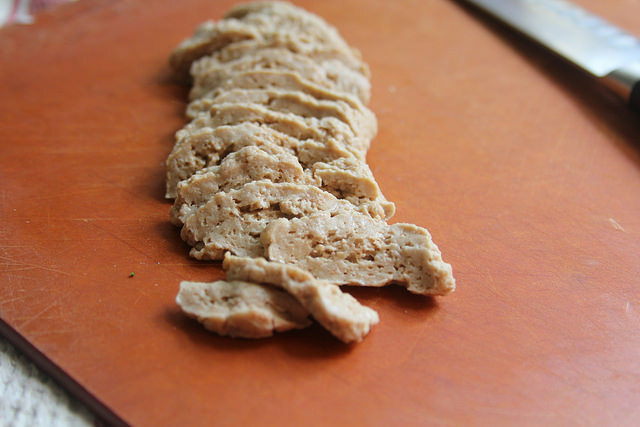 It doesn’t have to be homemade seitan that supplies that sense of satisfaction in your kitchen. It can be a good steak, the type that you thought only a professional chef at a steakhouse could render so well. It can be ice cream. Or bread. Or something that I have no idea exists—and maybe you didn’t, until you made it yourself. In a large bowl, mix the flour with 1 1/2 cups of the water and mix until the mixture comes together to form a ball. Let sit for 5-10 minutes to allow the water to absorb. Turn the ball onto a surface dusted with more whole wheat flour and knead for 8-10 minutes, until the mixture is smooth, flouring the surface as needed. Let the dough sit for 30 minutes to allow the gluten to develop. Place the dough in a large bowl and cover with water. Squeeze and rinse the dough under running water to remove the starches. Once the water runs clear and the dough no longer emits white starches when you squeeze it underwater (about 10 minutes), rinse thoroughly. This is now seitan. Press the seitan into a flattened rectangular shape, like a piece of flank or skirt steak. Pat with towels to remove any water. Slice into thin slivers. Cut the broccoli crown into evenly sized florets. If there is stem left, trim an inch or so off the base, then remove the thick skins, turning the stem a few times to cut it off all around. Slice the trimmed stem into discs about ¼” thick. Combine the black bean sauce, soy sauce, cornstarch, and 1 cup water in a bowl and stir well to combine. Heat 1 tablespoon of the oil in a large fry pan or wok over high heat. Once the oil is very hot (if a droplet of water sizzles when it hits it), add just enough seitan pieces so that they don’t overlap (you may need to work in batches). Season with a generous pinch of salt and pepper. Don’t stir for 30 seconds, then stir to release and flip the pieces over, being careful to separate any that are sticking together. 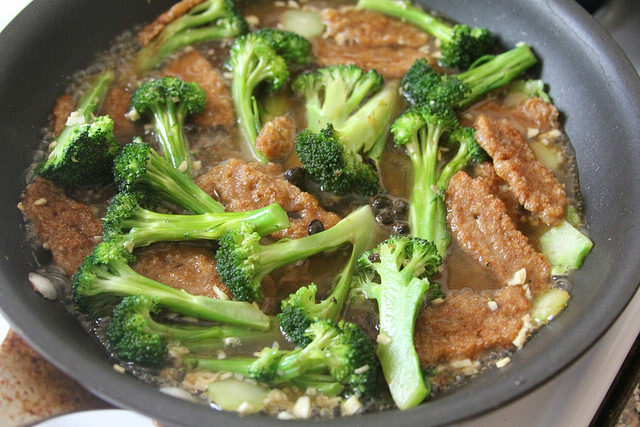 Cook the seitan, stirring occasionally, until each side is lightly browned, about 2-3 minutes. Transfer to a bowl. In the same pan or wok, add the remaining tablespoon of oil and once hot, add the broccoli florets. Season with a pinch of salt and pepper. Cook, stirring occasionally, for about 2 minutes, then stir the minced garlic (so as not to burn). Continue cooking for another minute or until the pieces are almost crisp-tender. Return the seitan to the pan and stir to combine. Make sure the heat is on high, and give the cornstarch mixture another stir before pouring it into the pan. Stir to combine, and continue stirring as the sauce bubbles and thickens. Taste for seasoning, adding soy sauce or salt and pepper as desired. You can also add a splash of water to thin out the sauce. Remove from heat and transfer to a serving bowl. Drizzle with the sesame oil and top with the chopped scallions for garnish. 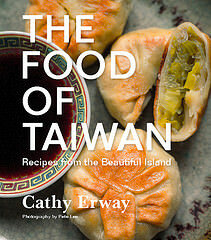 Serve immediately, with steamed rice. Four brownie points: Obviously, if you’re gluten-intolerant, seitan might not be the meat substitute for you. But it makes a great foil for beef in this simple stir-fry, and is high in protein without any fat or cholesterol. Broccoli will bump up the nutrients, so you’ll have antioxidants, Vitamin K and much more, and you can up the ratio of veggies to protein to your liking in this or any stir-fry. 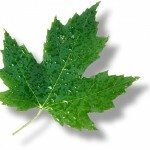 Eight maple leaves: It’s just a few pantry staples (garlic, oil, sauces, flour and rice) and one fresh vegetable (broccoli), which means you can churn out this dish any time of the year. Swap in seasonal produce of your choice. And pat yourself on the back for an all plant-based dish that doesn’t quite feel like it. Wow! I have never heard about this seitan. Thank you for sharing the recipe! I’ve been vegetarian for decades and seitan was the first faux meat i ever tried when i had it in a Chinese restaurant after moving to nyc for college. It freaked me out so much I didn’t believe it wasn’t meat and i made my omni friend take it home! Haha. I’ve bought it a number of times and i love that it takes on about any flavor you marinade it it. @Ttrockwood: Nope, just regular wheat flour! I know, I have also seen many recipes with wheat gluten flour of some sort. But I have no idea about that. This works, and that’s what I use! Thank you so much for the making me happy by sharing of this site and its so good also for the all new user.